My mom got me the Big Book of Crochet and this was one of the projects in it. 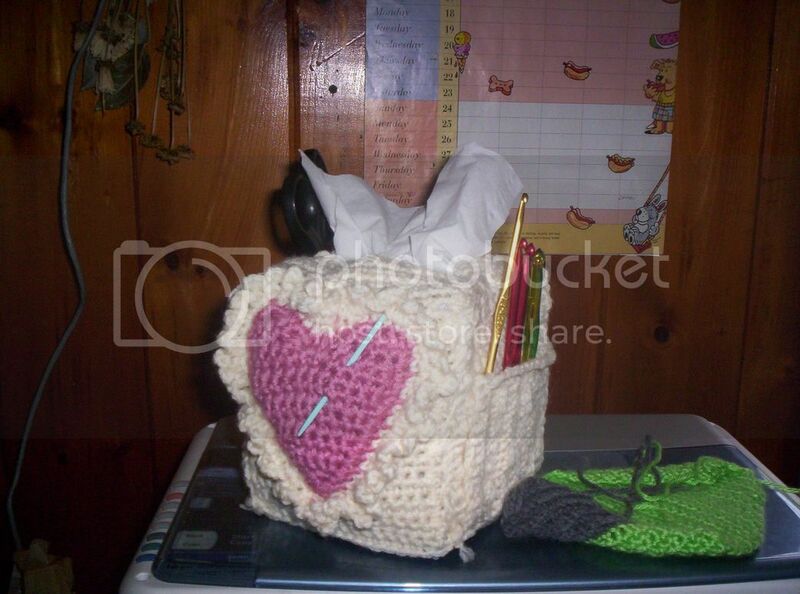 I didn't have fiberfill, so I stuffed the heart pincushion with yarn from a project I had to frog. I have my hooks, scissors and a needle already in it and has pockets for a ruler and a notebook and pen. Looks great! I saw that in the magazine and thought it was cute then and love it now. You did a fabulous job on it! Great job. 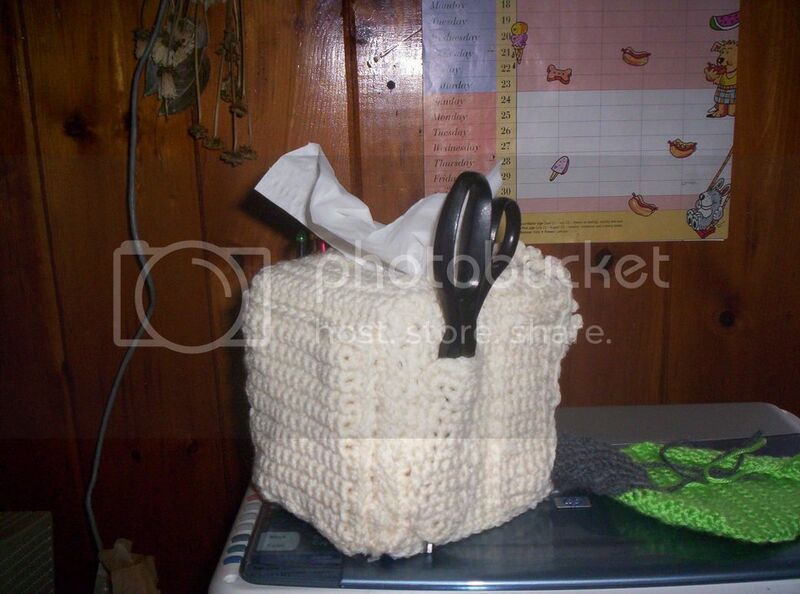 I always need tissues nearby, as well as my crochet stuff. That's a great idea. that is the coolest thing!!! GREAT JOB!! What a nifty idea, great job on it. Cool that's a neat idea! Neat!You have everything you need right at your fingertips. I'd never think of something like this! Looks great! That'd come in handy here right now since I have a cold. Cute idea !!! Thanks for sharing !!! "Crochet with Heart" magazine. I hope I am remembering the name correctly. It was my all time favorite crochet magazine. It is really handy, I still use it all the time. If you aren't needing tissues, the empty box is great to stash extra odds and ends, altho most everything I use does fit in the caddy. That's a great idea! Clever! In browsing through a stack of old crochet magazines looking for inspiration for my next project, I found the pattern for the Crochet Caddy Tissue Box Cover in the February 2002 issue of Crochet with Heart. The creator of the pattern won a CWH contest for best tissue cover design. One more time, a pattern I was wanting was lurking in my stash all along. . Anyway, I thought I'd share that in case anybody else is looking for the pattern, doesn't want to buy the entire book it's in, and unknowingly owns the magazine. You might be able to buy that magazine issue on ebay. I've bought several there. very nice! I had seen that in plastic canvas, and it was going to be my next challenge, lol ,in canvas though. Yours is simply adorable! You did a wonderful job! I made one too, but with slots for needles instead of the pin cushion and little pockets for a tape measure stitch counter. I didn't do the pad pocket. I love it and use it all the time. That sounds wonderful! How do I do that?